The photo was taken at Denny Park on Lake Washington. Dr. Harkins pats Dr. John Stevenson on the back at the Department picnic. 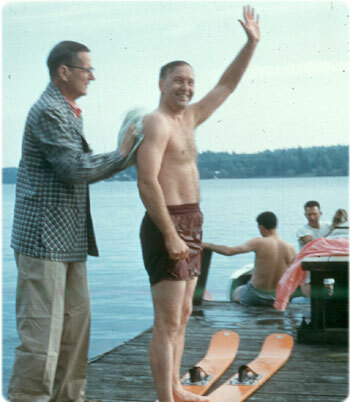 Later that day, Dr. Harkins suffered a fatal MI as he walked up the beach after getting up on a slalom water ski for the first time. The slalom water ski was one of his long-held goals. In 1955 “The Society of the Golden Pouch,” a spoof surgical society, was established by residents to honor the Department of Surgery’s first Chairman, Henry N. Harkins, on the occasion of a dinner celebrating his fiftieth birthday. The “founders” intended that the new society would disband at the end of the evening. The Harkins Society, as it was renamed, instead went on to become the Department’s Alumni Society. Its membership includes the Department of Surgery Faculty, former chief residents, and fellows. In 1963, the Society was incorporated as a tax-exempt organization. Today, the Harkins Society is rich with tradition. He served as Instructor in Surgery at Wayne State University and Associate Professor of Surgery at Johns Hopkins University before coming to the University of Washington as Professor of Surgery and the first Chairman if the Department. He was also the first chairman appointed to a clinical department in the new Medical School. He exerted an important influence in many of the subsequent appointments and helped guide the initial development of the School of Medicine. It was a time of recruiting for the school, developing curriculum, defining the School’s position in the medical community, and for organizing the research laboratories. Partially as a result of his second John Guggenheim Memorial Fellowship in Surgery, he began a trip that took him around the world one and a half times in 1965 to 1966. He served as a Visiting Professor at the Universities of Melbourne, New South Wales, Sydney, Adelaide, Kuala Lumpur, Witwatersrand, and in South Africa, Singapore, Auckland, Dunedin, New Zealand, and Sweden. While there he was honored as the Acrel Medalist by the Swedish Surgical Society.